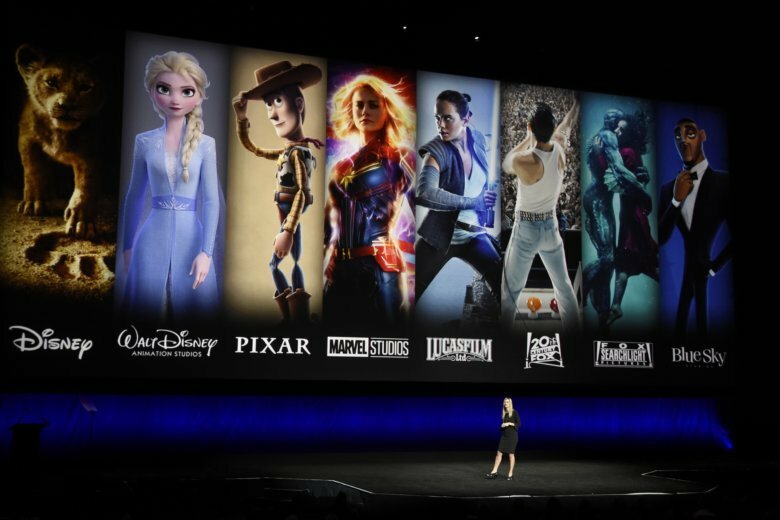 LAS VEGAS (AP) — The movie industry has returned to their day jobs Friday after four days of schmoozing, deal-making and watching movie studios and stars sell the best of what’s to come to theaters at CinemaCon in Las Vegas. Publicly at least, the big Hollywood studios were unwavering in their message: We’re committed to the theatrical experience. “We are all stronger advocates for creativity and the entertainment business when we are working together. All of us,” said MPAA chairman and CEO Charles Rivkin . Hollywood studios spend a lot of money to bring stars like Charlize Theron, Jim Carrey and Arnold Schwarzenegger , trailers and footage to Las Vegas, but the downside is that no matter how charming or funny they are, only a few really ever manage to break out in a big way. Paramount’s Elton John musical “Rocketman” got everyone jazzed and singing along to his classic hits, while teasing the high-highs and low-lows of rock star life. Universal’s “Yesterday,” about a struggling musician who wakes up from an accident to find that he’s the only one in the world who knows the music of The Beatles (and uses it to his advantage) also looks like it will be a fun summer charmer. Disney brought out the classic “everything the light touches” scene from its CG/live-action adaption of “The Lion King.” The stunning landscapes and life-like fur shown of Simba and his father gazing out at the sunrise had many seeing dollar signs in their future. And Lionsgate brought out a late-game charmer in “Star Wars: The Last Jedi” director Rian Johnson’s next film, “Knives Out,” a sharply-written Agatha Christie-style whodunit about a wealthy family whose patriarch turns up dead. The Disney/Fox deal may have been an arranged marriage, at least for the remaining executives at 20th Century Fox and Fox Searchlight, but everyone put on a good face for the theater owners while also referencing the magnitude of the change. It was a little strange to see a montage featuring “Avatar,” ”Titanic,” ”Hidden Figures,” ”Toy Story,” ”Frozen” and the “Avengers” all together. But the 2019 Fox releases have been officially blended in with the Disney releases (and some will have to move as they currently occupy the same release date). “We believe that together we will be more than the sum of our parts,” said Alan Horn, the Chairman of the Walt Disney Studios. Did you hear? 2018 was a record year at the box office with $11.9 billion in ticket sales. (Of course you did, because every studio and trade association chief made sure to mention it over and over again this week.) And yet this year the box office is still down nearly 16%. Privately, some smaller theater owners grumbled about the lousy first three months of 2019 in movies for their bottom lines, even with hits like “Us” and “Captain Marvel.” ”Avengers: Endgame,” is coming after all. But it takes more than one mega-hit to save an entire industry. It’s fitting, then, that the convention brought out “Crazy Rich Asians” director Jon M. Chu to talk about why when faced with a choice between a streaming release or a theatrical one for his film, he chose the theater.